Awards (2011): John Larroquette won both the Tony and the Drama Desk award for Best Performance by a Featured Actor in a Musical. 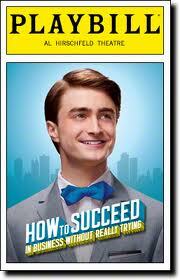 Revival of Frank Loesser’s musical satire on the American business world, starring Daniel Radcliffe (through January 1, 2012) and John Larroquette. Raunchy Little Musical – Belle Barth is Back!